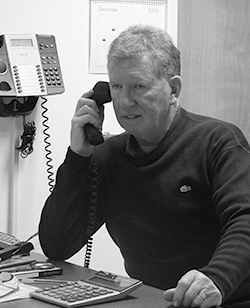 Norris founded the company back in 1968 and still oversees all aspects of the company today. As managing director, Norris is proud to be remain involved with both maintenance and sales of equipment. From leaving school at 16 years old Norris entered the garment manufacturing industry working in east end sweat shops repairing steam pressing equipment. Since then he has seen the company establish itself as one of the UK’s leading suppliers of equipment and spare parts to all industries in fashion. Major recent projects have included seeing the company move into its new home in Hackney which involved complete management of the development of the new building. Away from work Norris’s interest include Newcastle United FC, travelling to his home in southern Spain and his grandchildren Tia & Leo. Company director Robert is proud to oversee marketing, sales and product development at Norris Steam. 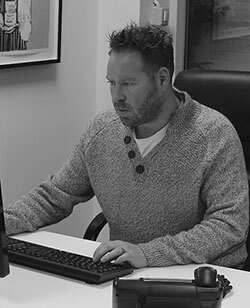 His responsibilities include researching the market for new products and to ensure our clients can always find what they need from Norris Steam. From joining back in 2000 Robert says he has seen a massive change in the company. Initially we were only providing goods and services to clothing manufacturing but now our clientele base is very diverse from dry cleaners, prisons, universities, theatres and retail outlets you can find our products everywhere. Through our teams hard work we are firmly established as the place to steam generator ironing systems in the UK. Away from work Roberts’s interest include playing football, cricket, swimming and watching Newcastle United FC.